The Trollwood Quilting Group of Fargo recently donated 35 homemade quilts to Hospice of the Red River Valley. The quilts will be given to hospice patients by our staff members. The group said we should distribute them quickly because they are already working on another batch! 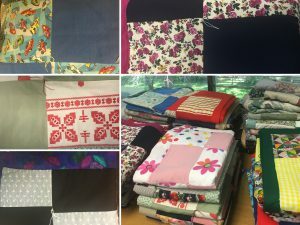 The quilting group accepts donations of sheets, sewing material, thread and mattress pads used for batting to continue making and donating quilts. If you would like to make a supply donation, please contact the volunteer department at Hospice of the Red River Valley at (800) 237-4629.